A row between a spy and his wife during World War Two almost compromised D-Day operations, secret MI5 files show. Spaniard Juan Pujol helped convince the Nazis the landings would take place in the Pas-de-Calais, not Normandy. But after being confined to their London house to protect his identity, his wife, Araceli, threatened to go to the Spanish embassy in June 1943. She said she would tell all about one of Britain's top double agents unless allowed to visit her mother. 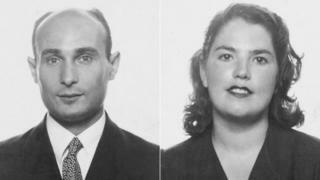 The family was based in Harrow, north-west London, where Mr Pujol - codenamed Agent Garbo - had a network of sub-agents sending false intelligence reports to his German spymasters. His feedback of false information to the Nazis diverted them away from the scene of the actual D-Day landings on 6 June 1944. Mrs Pujol not only struggled to cope with the pressure of the family's double life but also became homesick. She was missing Spanish food and became upset at her husband being absent so often. Fears that the Pujol family would be recognised on the streets of London, led to Mrs Pujol being frustrated at the restrictions imposed on her and their two children. In the secret files, released from the National Archives, the moment Mrs Pujol confronted her husband's case officer is recorded. "I don't want to live five minutes longer with my husband," she screamed at Pujol's MI5 case officer, Tomas Harris. "Even if they kill me I am going to the Spanish embassy." Agent Garbo would not only deceive the Nazis by pretending to be their agent and provide false information but he also tricked his wife into staying quiet. Despite Garbo's case officer coming up with the idea to tell his wife he had been sacked, the double agent did not think this would be enough. Because Mrs Pujol was not able to go back to Spain, he suggested a plan to convince her that her outburst had led to him being arrested. She was even taken to visit him, blindfolded, in a detention camp and, after the reunion, was convinced of the need to support his undercover work. MI5's legal adviser, Maj Edward Cussen, told her he had decided her husband should be released and allowed to continue the mission. "He reminded her that he had no time to waste with tiresome people and that if her name was ever mentioned to him again, he would simply direct that she should be locked up," Mr Harris noted. "She returned home very chastened to await husband's arrival."